Here we are in Ollantaytambo, the next destination in our trip, with very sore legs and for me, a swollen knee. We arrived here last night after completing the trail, spending a few hours at Machu Picchu, then another few hours in a town called Aguas Calientes, and finally an extremely slow train ride here to Ollantay. It was a long day (we were up at 3 am to begin day 4) and I don’t want to see another step or hill for a long time, but this area is full of them, so there is no escape! The 4-day Inca Trail was the most challenging physical and mental thing I’ve ever done. There were a few times I didn’t think I could make it to camp, but also knew there were hours of trail ahead of me: that’s where the mental challenge is — willing yourself to forge onward… Wondering what happens when your muscles and body just don’t have any more to give, like a dry gas tank… Working through pain and sore body parts… Working through managing a mind that is “sick of it” (upon seeing what appears to be a never ending hill or stairs). The trail is a very individual experience in this regard. The physical challenge is obvious — we were climbing and descending giant and steep mountains in the Andes! The high altitude makes it hard to breathe, and the descents in steep and rocky terrain were hard on the knees. So were the stairs. I for sure would have been better off in better physical shape, I did not get as fit prior to the hike as I should have or wanted to. But I still made it! All that said, it was amazing and the finishing point of Machu Picchu was like the best written climax in any great quest story. Machu Picchu is a special place, made so all the more with our effort to get there, and really getting a sense of place by walking and sleeping with “Pachamama” (how the Incas called Mother Earth). Though, many times I wanted to give Pachamama the finger! It was jarring to join the throngs of tourists who arrived by bus and train. I’d developed this sort of mental cacoon on the trail, which was free from all the junk that comes with crowds of people with agendas and to-do lists. It was a shock to the system and the only down side to the entire hike experience. 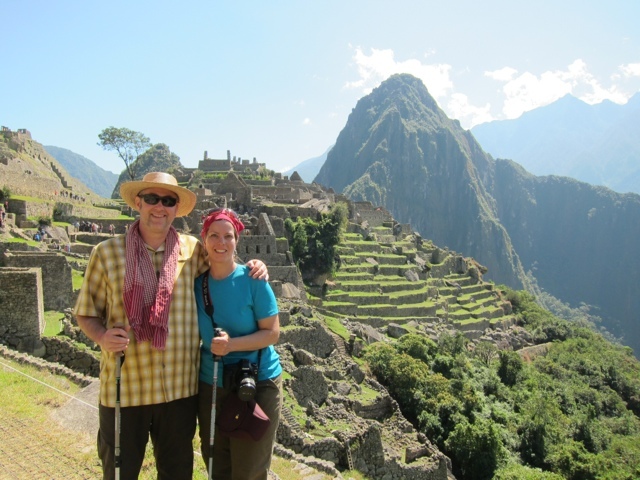 You are currently reading We Survived the Inca Trail at On the Road.